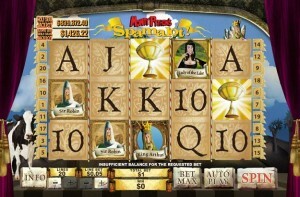 Free Online Pokie << Spamalot >> by Microgaming - Play Demo Now! Spamalot was released in 2012 by Playtech. The game has a set of 5 reels and 20 paylines. The graphics of the game are bright, colorful with animated cartoon characters which are inspired by a Broadway musical comedy known as Monty Python’s Spamalot. The symbls on the reels are taken from the film itself and include The Holy Grail, Monty Python’s Logo, King Aurthur, Lady of the Lake, Sir Lancelot, Sir Robin, Sir Galahad and some high value playing card symbols (Ace to 9). In the background the game has adopted the soundtrack from the film, with occasional chorus and music played out in the gameplay. The highlights of the game are Holy Grail jackpot and the Bonus Features. The game has 5 reels and 20 paylines. The coin size varies in the denominations of of 0.01 up to 1.00 per pay line. The minimum bet amount is 0.01 and the maximum bet amount is 20.00 per spin. The maximum payout of the game is 5,000 coins per bet line other than the Holy Grail Jackpot Payout. The Holy Grail symbol in the game is the wild symbol. It can substitute for other symbols to complete the winning combinations except the scatter symbols. Monty Python’s Logo, Bonus and The Jackpot Game symbols in the game are the scatter symbols. 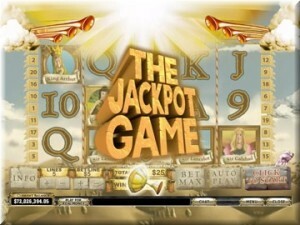 The jackpot game scatter symbol only appears in the free spin feature round, it activates the Holy Grail jackpot game. The Bonus scatter symbol appears only on reel 1 and 5 and when it does appear simultaneously, it activates one of the four bonus games. Three or more of the Monty Python’s Logo scatter symbol scattered anywhere on the five reels activate free spins. In this feature, player is awarded 10 Free Spins with Random Wild symbols, and the Holy Grail Jackpot Game. During this feature, collecting 5 Jackpot Game symbols will activate the Holy Grail Jackpot Game. This game is activated if player manages to collect 5 jackpot game symbols during the free spin round. In this Jackpot Game players win cash prizes, and by climbing up 6 levels they will have a chance at the Holy Grail Jackpot or the Slightly Less Holy Grail Jackpot. 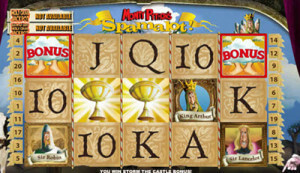 The game contains four bonus game and all Bonus Feature games are triggered the same way, with the Bonus Spamalot symbol appearing anywhere on both reels 1 and 5 simultaneously in the main game. In this feature player is outside a castle with one of 6 spots available to choose, player selects a spot and the castle occupants throw a cow, if player is not hit, a cash prize is awarded and player gets to choose another spot. When hit, the wins are collected and player returns to the main game. In this feature, player faces the Black Knight.Player has a 5 x multiplier to the wins to start with and player must strike at the Knights limbs. If hit is successful, player wins a cash prize, if its a miss, player multiplier drops by one. At the end of four attempts, the accumulated cash prize is multiplied by the remaining multiplier and player is returned to the main game. In this feature player collects a shrubbery and present it to the Knights who say Ni to appease them and they offer player a cash reward, player can accept this reward or try again with a different shrubbery but must accept the third offer if player goes that far and are then returned to the main game. In this feature, player has six nights to get across the path and the Killer rabbit is hiding behind the rocks, blow up one of the rocks with a grenade and one of the Knights will attempt to cross. If player misses the Killer Rabbit, the Knight will be eaten and player gets to throw another grenade before another Knight attempts to cross. If player takes out the Rabbit with the grenade, all remaining Knights get to cross safely. Each Knight that crosses wins a cash prize. The game is based on a broadway musical known as Monty Python’s Spamalot. It is a musical comedy adapted from the 1975 film Monty Python and the Holy Grail. Like the film, it is a highly irreverent parody of the Arthurian Legend, but it differs from the film in many ways. The original 2005 Broadway production, directed by Mike Nichols, won three Tony Awards, including the Tony Award for Best Musical of the 2004–2005 season and received 14 Tony Award nominations. During its initial run of over 1,500 performances it was seen by more than two million people and grossed over $175 million.